TORONTO – RBC Capital Markets has agreed to purchase flow-through and common shares of Marathon Gold Corp. in a bought deal worth a total of $16.18 million. RBC is buying 8.0 million flow-through shares at a price of $1.25 each plus 6.0 million common shares at a price of $1.03 each. The underwriter has also been granted a 15% over-allotment. 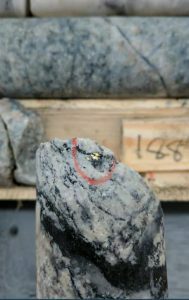 Visible gold in drill core from the Marathon deposit at the Valentine Lake project. Marathon intends to use the proceeds of the flow-through offering to advance its exploration program at the Valentine Lake gold project 55 km south of Buchans, NL. Earlier this year, the company said that total open pit and underground measured and indicated resources of 22.57 million tonnes grading 1.91 g/t gold and containing 1.39 million oz. of gold. The inferred resource is 10.67 million tonnes grading 2.24 g/t and containing 766,500 oz. The net proceeds from the common share sale will also be used for exploration and development activities at Valentine Lake. To find out more about the Valentine Lake gold camp, visit www.Marathon-Gold.com.